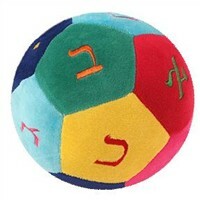 0150- Aleph Bet Plush Ball 6"
Aleph Bet Plush Ball 6"
Soft plush ball, about 6" diameter. Great for babies and toddlers! 12 multi-color panels containing the first 12 letters of the aleph-bet.